Hello all, does anyone have the RH handlebar control for a 1971 CB350 twin. I bought the bike this year and the previous owner had fitted a generic light switch control as he said the one on the bike was not working. It works fine for the lights but i had an issue with the battery going flat as the new switch did not activate the higher level change to the battery when riding with the lights on. I don't know if the controls from another model may fit so if anyone knows I would appreciate any advice. I assume it's an import K2 or K3 model without kill switch (kill switch came on K4) as CB350K0->K3 was never sold in the UK. I think the CB175 switch was similar but just look for one with the extra wires (I think they are yellow and white/yellow). Another option would be to fit the rotary switch into the headlamp bowl, which was the arrangement on the early CB250 UK model. Thanks for the prompt replies, it is an import and it does have the kill switch, this had been left connected by the previous owner and still worked. There are 9 wires in total, black+white, brown+white, white, blue, red+yellow, white+yellow, yellow and 2 x black. Ideally i would like to get a replacement so that it stays original but if i have to modify it thats not a problem. I think you have the correct switch ..probably wiring thats wrong somewhere ... can you post pics of internals of switch. The ones with the high/low charge have two rows of connnector contacts with the sliding brass U shaped moving contact. I will try and post a photo but yes it has got the brass sliders inside. I did try connecting up the switch but the light controls did not work only the kill switch and the starter. That's the correct switch with the dual row of contacts so it must be a wiring/ contact resistance/ alternator issue. You need to go through the wiring and check everything. I think the issue is a faulty switch as i disconnected the aftermarket switch that the previous owner had fitted that was working fine and then connected the original back up in the correct way and the lights didn't work, they worked fine on the aftermarket switch and it was just the charging issue that was causing a problem. 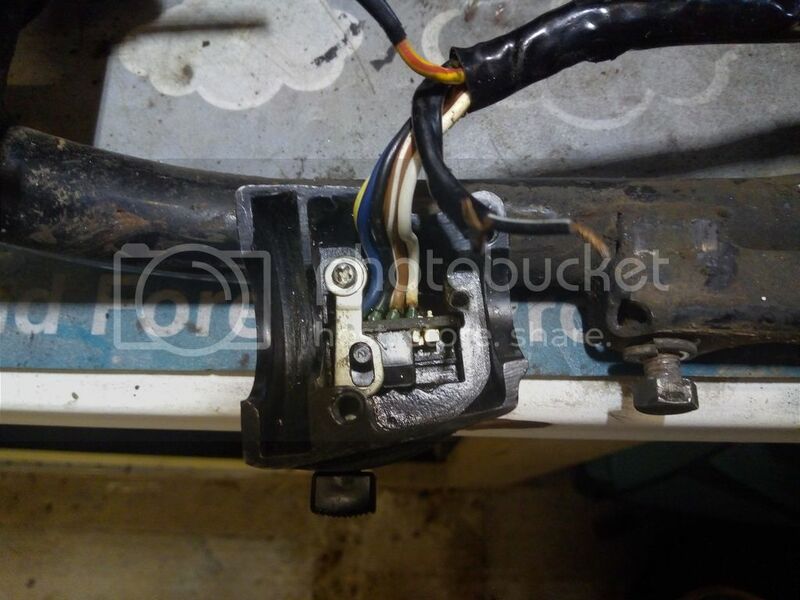 It looks like it has been taken apart before as there was damage inside and the plate that holds the wires in place has come off and the screw hole is chewed up. The kill switch and starter were still working fine. May be the contacts or the sliding 'U' shaped Brass sliding connecting bar . Try cleaning and compressing the U shaped contact bar slightly. Best to assemble the U contact onto the pins outside of the body and see that there is plenty of grip between the fixed and moving contacts when you slide it back & forth. After cleaning apply a little bit of silicone grease. If anything is badly pitted you could rob parts from another Honda switch as those parts are common to a lot of models. This maybe a daft question and excuse me if it is but should the front brake control have a switch for the brake light as there doesn't appear to be one and there is no brake light coming on when the front brake is applied ? I was just wondering if someone had been messing around with the controls and if this may be linked ? Thanks Bryanj, it looks like someone must have changed my levers at some point as there is nowhere to even put a cable. I will have a look where you have suggested.